Enjoy this yummy recipe for thai lettuce wrap! Our Turkey Thai Lettuce Wrap with creamy coleslaw may very well become your new lunchtime fave. 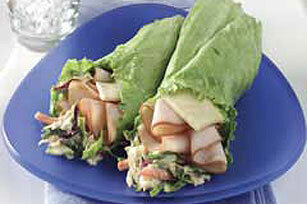 Toss coleslaw blend with dressing and teriyaki sauce; spoon evenly onto lettuce leaves. Top with remaining ingredients. Fold in sides of leaves; roll up tightly to completely enclose filling. Serve immediately. Or wrap tightly and refrigerate until ready to serve. Substitute soy sauce for the teriyaki sauce. Add 2 tsp. PLANTERS Dry Roasted Unsalted Peanuts, chopped, and 1 Tbsp. chopped cilantro to the filling ingredients before spooning onto lettuce leaves. Makes 1 serving, 2 wraps.